Posted: Wed Dec 21, 2011 9:59 am Post subject: What's your latest Avengers purchase? What's your latest purchase? Last week I won a bid on ebay for a photocard of Gareth Hunt produced for Woolworth's when he made a personal appearance there in '79, signed by the great man himself. I was really pleased to get this as Gareth's is the only Avengers autograph I haven't got (apart from Ian Hendry). It was a real bargain as well. Just over £4! 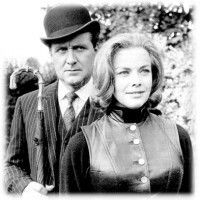 Well, my last The Avengers purchase was the book "Das Konzept Emma Peel - Der unerwartete Charme der Emanzipation". 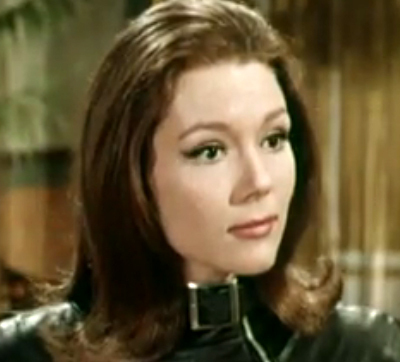 It's a book about the whole character of Emma Peel. What is special, why is the character so successful,... . It is absolutely amusing to read, even though some things I already know. It's because of the accurate and enjoying diction to describe the character, the relationship,... all in all the whole book! When I saw the thread title, it made me just think of what new items were around to buy.. and that's not overly much really! The new 50th Ann book.. the new Calendar.. and the new dvds! But speaking of older stuff. I keep buying the odd older interesting magazine for Avengers articles.. I've been collecting TV Comics for years, and keep buying the odd (not too expensive) issue with Avengers in. Going back a few months.. I bought Andrew Pixley's Avengers Files book for a couple of quid from ebay. French version of the 'Dead Duck' novel (Canards Mortels!).. and speaking of autographs I bought the New Avengers trading card autograph chase set for a reasonable sum.. though thinking about it.. that could have been a couple of years ago. Time flies.. I bought the second annual based on the Tara King series (published in 1969). I was lucky to pay 20 quid only ! The new 50th Ann book.. the new Calendar.. and the new dvds! I've bought 50th Anniversary book and the new Calendar 2012! Well, the new Anniversary DVDs (complete boxes) I do not really need. I already happy with my 2 DVD boxes of Season 4 and 5 (published 2009). My last purchase was the 50th anniversary box set. After all the problems with faulty discs, it's great to be able to sit back and appreciate just how fantastic these remastered/restored episodes look. The Tara King episodes, which in the past have looked quite poor, are particularly stunning. Hopefully someday we'll get a remastered/restored release of The New Avengers. I've never heard of this book. My German is virtually non-existant so I wouldn't be able to read it. I did buy a French book back in the mid-90's by Eric Cazalot, which I also can't read, but fortunately it's crammed full of rare pics. Rich. I didn't buy the 50th set, but after waiting for the corrections, I bought the 5 individual sets from play about 2 months ago. Fantastic quality. I did email optimum about restoring TNA, but haven't heard back. If enough people email them, they might consider it a good idea. Rich. My last Avengers purchase is Optimum's season 5. The New Avengers' 'House of Cards' paperback. 10 pence, I think, from a charity shop. Ordered John Peel's Avengers Files (first 4 books, covering the first TV series) and Douglas Enefer's novel (the only story involving Cathy Gale). Ordered at EBAY: The Avengers On Target, 1986 (all interview issue), Stay Tuned Vol. 1, issues 2 & 3, The New Avengers Files, 1986. All for a Russian fan club "Steedumbrella". The development of the population! You're quite right. The book from Franziska Fischer is the best one in German. My last perchase was the french pressbook for the late 60's film release of reedited episodes. Last one before that whould have been a 1960's Avengers wristwatch. John Peel's Avengers Files are a disappointment to you, I'd bet. And I'd put more money on your having greatly enjoyed the Enefer book, it's easily one of the best and should have been an episode of the show. I started this thread 7 years ago. There's not so much new stuff out there,but this turned up in the post today in great condition. I've been after this single for years. It sounds great on the old turntable! Rich. Glad you enjoy it; I always hope to find an Avengers jigsaw! My last purchase would be the Tunnel Of Fear DVD. Mine is :Too many targets CD, and a custom Juniper "Diana Rigg" model, in the outfit from "The 13th hole". Always liked it. This was to add to other customs i've had over the years-of various outfits. They look good on display. Last month I bought first Avengers Blu Ray - from Lionsgate. It's still in stock overseas, but I hope it will come to the New Year. I already have a Blu Ray drive for a laptop, it remains only to find a suitable software for watching the episodes with the capabilities of the detailed zoom of the picture. At the time I tried about 10 programs, and there is either an inconvenient zoom or not at all. However, when the Blu Ray comes to Moscow I will study this topic in more detail.